Happy Memorial Day Weekend! Today for Friday, we’re going to take a look at some Amazing Makeovers from this week’s Inspire Me Monday Linky Party. I hope you’ll be impressed and inspired to tackle your own makeovers, big or small. Use the arrows buttons above or arrow keys on your keyboard to scroll through the slide show. Click the links in each caption to be taken to the full posts. Thank you so much for the feature! I hope you have a lovely weekend. You are very welcome! I love your ingenuity! wow! thank you SO MUCH for choosing to feature my garage wall garden. a girl’s gotta look at something pretty, right? Absolutely! I think it is brilliant camouflage and looks amazing! Kim, you made my day! Thank you so much for featuring my island. I’m so happy with the makeover. I don’t think I’ll ever be painting all my kitchen cabinets, but now that the island is painted, I don’t feel that I’m drowning in a sea of brown any more. Now to finish the last couple of small projects so that my mini kitchen remodel will be complete! Wish you could come down, grab a cold drink from the beverage fridge, and join me for a visit on the porch! Thanks for featuring my tray makeover Kim!! I hope you have a Happy Memorial Day weekend! 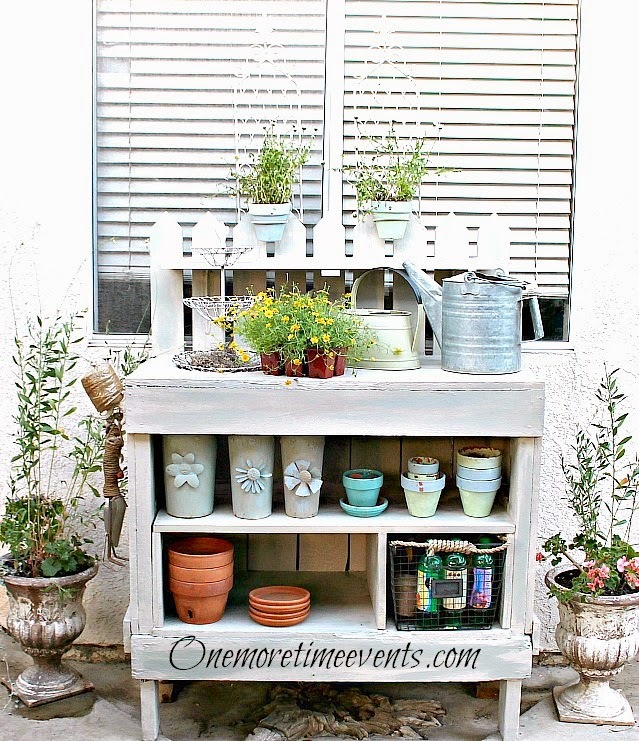 Thank you so much for featuring my potting bench…Hope you have a great Memorial Day Weekend.